The Wirtschaftswoche has published its ranking of the most research-intensive business economists in the German-speaking world. A total of six scientists from WHU were listed in the three categories of the ranking. WHU Professor Dr. Nadine Kammerlander in "Top 40 under 40"
The magazine CAPITAL elected Professor Dr. Nadine Kammerlander, director and chair holder of the Institute for Family Business at WHU, among the "Young Elite - Top 40 under 40" in the category Society and Science at the Young Elite Summit 2018. Professor Craig R. Carter, Arizona State University, Professor Dr. Lutz Kaufmann, and Dr. Claudia M. Wagner, both WHU – Otto Beisheim School of Management, received the Journal of Business Logistics 2018 Best Paper Award for their paper "Reconceptualizing Intuition in Supply Chain Management." High quality and groundbreaking research in the fields of management, economics, and business administration is one of the key pillars of excellence at WHU. The school places particular emphasis on creating a stimulating environment for independent research in business and economics topics, coupled with attracting and supporting high-profile researchers with the ultimate aim of delivering first-class research outcomes. WHU further pursues its mission by combining academic rigor with tangible, practical relevance in all its research activities. WHU is home to 51 professors who are currently engaged in research and have received significant academic acclaim through their involvement in numerous research projects both at home and abroad. WHU is also committed to supporting young academics. These highly motivated assistant professors, postdoctoral, and doctoral students greatly enrich the research capabilities of our school. WHU’s high level of research capability can be attributed to the strict adherence to three fundamental research principles: these are quality, internationality, as well as practical and academic relevance. The school’s consistent long-term focus on independent cutting-edge research has already borne fruit: WHU has now become one of the most renowned German research institutions in the field of management studies and is on the verge of joining the leading group of European institutions in the field. WHU’s capability to conduct and deliver first-rate research in business and management topics is a consequence of its adherence to three key research principles: these are quality, internationality, as well as practical and academic relevance. WHU researchers recognize that the interplay of these three principles is paramount to achieving excellence in research and truly tangible outcomes. It is precisely for this reason that both WHU as an institution and its researchers steadfastly adhere to these three cornerstone research principles. “Quality not quantity” is the guiding principle for our faculty members. This manifests itself in our excellent research results being published in some of the most renowned and leading international journals. Delivering cutting-edge, premium research is of paramount importance to WHU. WHU faculty members are engaged in an ongoing process of exchange with the research community and regularly in attendance at international conferences. They also frequently accept invitations to visit internationally renowned universities and attend their research colloquia. WHU is currently in the unique position of being the sole private German business school with membership of the German Research Foundation (DFG). Membership of the DFG requires member institutions to comply with strict academic principles. It is for this reason that WHU has permanently established a commission to safeguard good scientific practice at WHU. Researchers at WHU are aware that excellent research and outcomes typically are only achievable in an international research environment. This global research mindset motivates WHU to maintain close links to internationally renowned educational and research institutions such as the Kellogg School of Management, Northwestern University in Evanston Illinois, the University of North Carolina at Chapel Hill, or the China Europe International Business School (CEIBS) in Shanghai. Research in management studies should not merely advance theoretical knowledge in the field, but also be of significant value to the practical side of the discipline. The firm conviction we hold motivates us to place significant emphasis on enhancing the practical relevance of our research activities. Our researchers work in close cooperation with companies, examining practical issues from a theoretical perspective and creating a nexus between academia and business. This is reflected in particular in the WHU research centers, some of which are sponsored by leading companies. WHU’s research results are also directly incorporated into the programs the business school offers to its students. The close and ongoing cooperation between the individual university groups ensures that the diverse programs are regularly updated to reflect the latest theoretical findings. Are you an academically excellent and highly motivated student interested in pursuing research in one of our fields of study? Economics, Entrepreneurship & Innovation, Finance & Accounting, Management, Marketing & Sales, and Supply Chain Management. Explore the publications of our WHU research experts in peer-reviewed journals and books on management education and business-related themes to discover our research in detail. We examine how the corporate tax system, through its treatment of loan losses, affects bank financial reporting. Exploiting cross-country and intertemporal variation in income tax rates and loan loss provision deductibility, we find that loan loss provisions are increasing in the tax rate for countries that permit general provision tax deductibility. When general provisions are deductible, a 1 percentage point rate increase leads to a provision increase of 4.9% of the sample average. This effect is driven by the tax system's encouragement of timelier loan loss recognition, suggesting that corporate taxation is an important determinant of bank financial reporting transparency. Many relations in social settings, such as management accounting, are bidirectional. Some effects unfold rapidly, and others occur slowly. Quantitative research in empirical management accounting has largely ignored this phenomenon. Our paper makes a case for integrating the time dimension into theory and empirical analysis. Using the relationship of an organization's strategy formation approach and controllers' involvement in the strategy process, we illustrate how bidirectional effects of different speeds can be theorized. Moreover, we show how cross-lagged effects models can help to test the direction of an effect for a given time interval. Data from two matched surveys with a four-year time lag provide the following results. First, in a baseline model, we replicate previous cross-sectional approaches and find similar results, namely a statistically significant relation between strategy formation and controller involvement. Second, we exploit the time dimension and find a statistically significant association between involvement at t1 and strategy formation at t2. This is consistent with the view that controllers shape the strategy formation approach in a slow, bottom-up process that takes several years. Thus, whereas previous cross-sectional studies assume controllers' involvement results from the strategy formation process, our study finds that controllers can also play an active role in shaping the organization's strategy process. The results illustrate how incorporating bidirectional effects and considering theoretically meaningful time intervals can improve theory development and theory tests in management accounting research. Discrete choice experiments such as choice-based conjoint and dual response are popular preference elicitation methods, yet, they can suffer from context effects, extreme response behavior, and problems with estimating consumers’ willingness to pay accurately when the purchase probability is high. This study proposes two new features to avoid these limits: (a) strictly separating all forced and all free choice questions and (b) an adaptive mechanism to select fewer, but more informative, free choice questions. The use of these two features invokes two new discrete choice experiment methods: separated dual response (SDR), with just the first feature, and separated adaptive dual response (SADR), with both features. A conceptual comparison, simulation study, tests to address endogeneity concerns, and three empirical studies demonstrate the appeal of these two new features, relative to the benefits of existing discrete choice experiments, especially when estimating willingness to pay. WHU – Otto Beisheim School of Management is committed to achieving the best possible outcomes in both teaching and research, coupled with the determination to adhere to the principles of social responsibility. WHU also makes significant contributions to the academic community, as faculty members take on additional tasks such as being a departmental editor or member of an editorial board. The editor-in-chief influences the orientation, the content and the quality standards of a journal to have an impact on the scientific progress in the respective discipline. I took over the position as editor-in-chief of the journal Economies in 2013, which gives me the opportunity to contribute to shaping and to further developing an international scientific journal according to my personal ideas. Family Business Review is the leading academic journal dedicated to understanding family firms. The work as an Associate Editor is a fulfilling but also responsible one, because we need to foresee the trends in family firm research, identify manuscripts with high potential, and help the authors improve their work. As Senior Editor of the POM journal for more than 15 years, I got to review a fair amount of working papers in Operations Management and at the interface of OM and Marketing. Selecting referees and evaluating the submissions to the journal is an intense process which allows me to learn inspiring insights and methodologies. This helped me to develop as a researcher and teacher. Conducting and delivering first-rate research. A total of 51 WHU professors are currently engaged in research and have received significant academic acclaim through their involvement in numerous research projects both at home and abroad. Feel free to browse through our expert database to find out more about the current main research areas of the WHU professors. Reflecting the vivid science scene at WHU. WHU was ranked 14th in the recently published Wirtschaftswoche ranking of the universities with the most active research in business administration. WHU Professor Dr. Christina Günther was awarded by the Hans Sauer Foundation and the Social Entrepreneurship Academy. "Family Business and Medium-Sized Business Research Award"
Professor Dr. Nadine Kammerlander and Jonas Soluk received the "Family Business and Medium-Sized Business Research Award". WHU Professor Dr. Lutz Kaufmann describes his experiences as European Editor of the Journal of Supply Chain Management. WHU Professor Dr. Tillmann Wagner has been named Outstanding Reviewer by the Journal of Service Marketing (JSM). Vescore, a boutique of Vontobel Asset Management in Zurich, awarded WHU Doctoral student Nabil Alkafri a research grant. Professor Dr. Arnd Huchzermeier is Department Editor and Advisory Board Member for the Management & Business Review (MBR). Benefit from our school's great variety of extraordinary research events. Our research events are an integral part of the research at WHU. 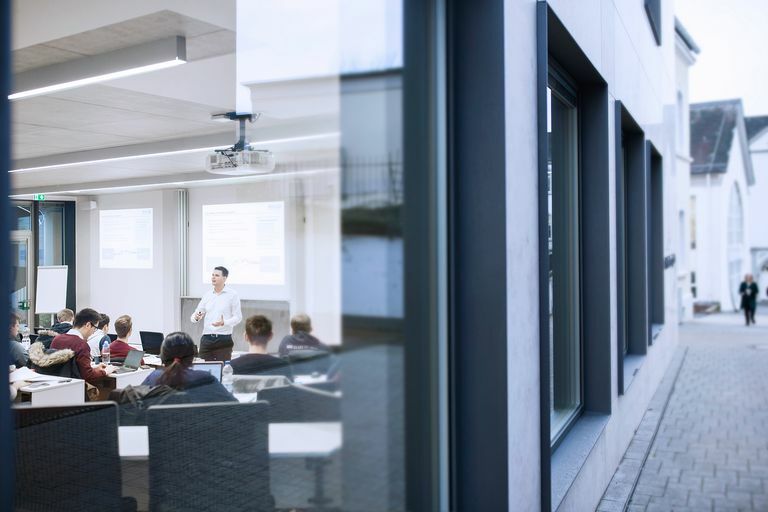 In the WHU Research seminars, the participants will be acquainted with current research from various disciplines in business and economics through academic presentations, critical reflection and discussions. Campus for Corporate Transformation is a new WHU initiative dedicated to exploring the challenges and opportunities of corporate transformation.